I think we have to ma a proposal. Maybe someone (the creator for example…) should first simply informally get in touch with any dev a bit concerned about addons, etc. I will check in the doc for the guidelines (my addon is already +/- PEP80-compliant, it won’t be too difficult to get it fully compatible). What bothers me is that it currently is in development stage, I would wait a bit and get more feedback from users before asking for trunk-integration. Speaking of developement, version 1.6 is now available with… custom coloring option! Please try it! I am currently not very happy about the layout, if you have better ideas about how/where to place widgets, I would be happy to hear them (maybe simply make a proper panel rather than integrating in an existing one?). Another (small) change is the line width now limited to 10.0. It’s actually a limitation of bgl/OpenGL, maybe you had already seen that values in 10.0-20.0 in the UI had no influence on the display. It is possible to see the border lines in occlude geometry mode ? That would mean it should force OpenGL to render them even if placed behind other parts… I’ll see what I can do. EDIT: ok, got it, simply have to disable GL_DEPTH_TEST. I’ll update that. Well… I’ve got some problems retrieving current SpaceView3D (to check if use_occlude_geometry is on). It’ll take a bit more time than expected (maybe until this evening… :-/). Thanks man, very cool job! Version 1.7 adds optional geometry occlusion, based on the mode active in each view. Just released version 1.8, which fixes a bug about custom color picking. BTW: thanks for all your comments! I really hope this addon can be useful to you. Don’t hesitate to make requests, suggestions, etc. Have you right clic on RAW and save in .py ? Look if it’s not an html. Hi thanks, it was a py file, but not from raw. It works now. It should be a great help in retopology. Would it be possible to make those edges outlined too which are not making faces? Nice add-on Really useful with retopo + hidden lines shading. 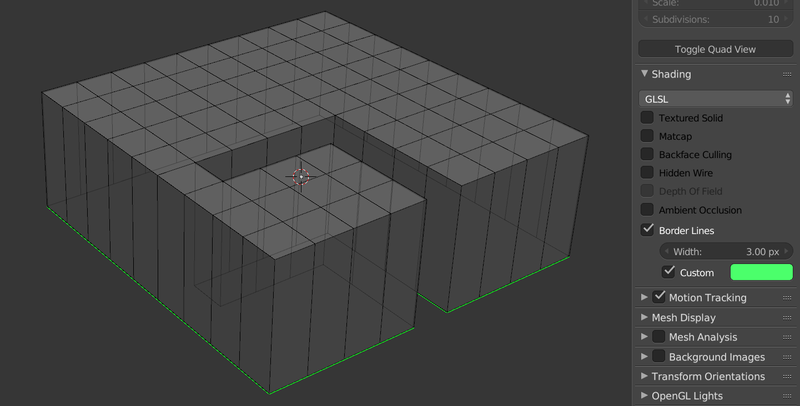 Tick border lines in edit mode, go object mode and back to edit mode > Blender crash. will you update this to 2.8? i really need this a lot to locate open mesh areas. or is there another solution already for 2.8? It’s Matpi’s addon, so I don’t know if he will do it. But it can be done, later.